How many of you do your own laundry? Well, I do. Since I moved overseas to study and live, that was the start of a turning point for me! Enjoying food made with University mates! I had to do my own cooking, washing, cleaning and all my own personal duties. Living overseas in a place like Australia, most of us cant afford domestic help as that was very expensive! We learnt to use washing machines. Sometimes at home. Sometimes communal coin operated washing machines. Coin-operated laundromats that I used in Fukuoka, Japan..
We had to learn to pick a good detergent, be it powdered or liquid to be used when washing our clothes whether at home, or bringing it to the laundromat. 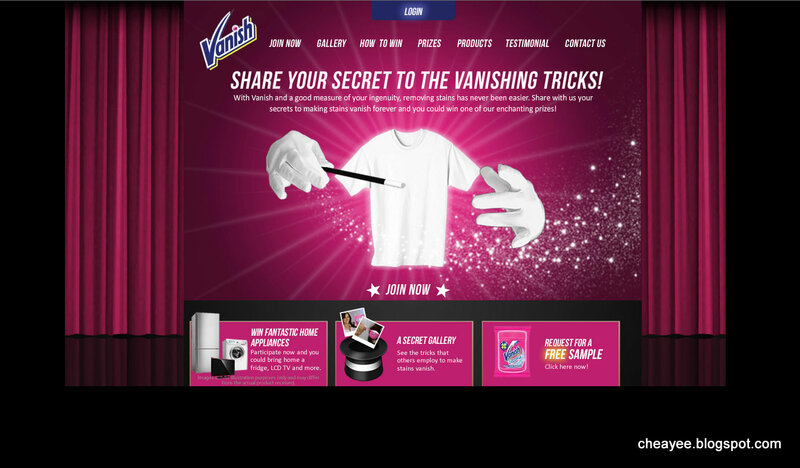 I was recently sent samples of this powdered laundry detergent, called Vanish. It comes in two types, the pink container (for coloured clothing), and the brightening type for ONLY white clothes. White, and Pink containers of Vanish! I took 1/2 a spoon of the powdered detergent for my clothes. Poured it into my washing machine. And just let the machine do its washing, spinning. Soak if you need to (as per instructions on the washing label of the Vanish container). And what is the outcome? A clean pair of jeans. (or clothes). See no stains! And the colours are deep. Want to try it out? Here's your chance. The good people at Vanish is currently giving out free samples. Screenshot of the Vanish website. Vanish is also currently holding a online contest! On the same page, http://bit.ly/1aIkd2I, look for the contest option, create an account, and share your cleaning tricks (better if you include photos). You may just win some of the fantastic prizes above! Kishore, u want to do advertisements for them?